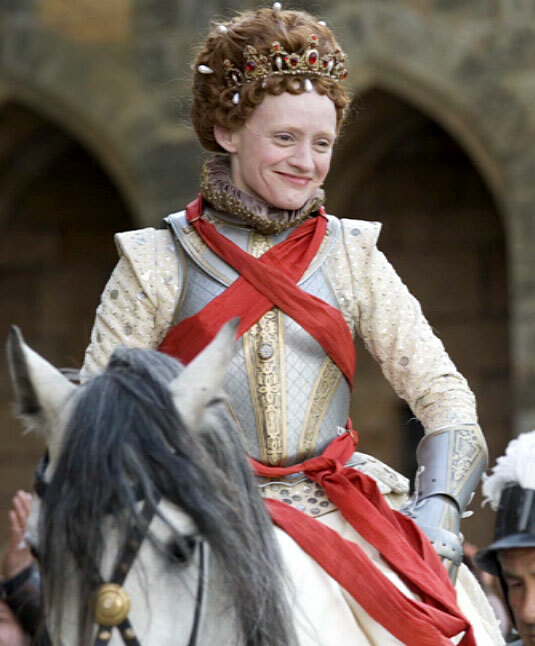 Despite the unassertive presentation of the DVD boxset I bought, The Virgin Queen (2005) turned out to one of the best historical dramas I’ve seen in a long while. Obviously it still suffers from a little compression and elision as it attempts to tell the story of Queen Elizabeth I from the start of her forty-five-year reign to the moment of her death, but the performances were so lively and the dialogue was so engaging, that these flaws were far less noticeable than they are in lesser examples of the genre. The hair and make-up team also made a convincing effort to age their lead actors across the decades, which helped to mark the passing of time… and Anne-Marie Duff did an excellent job of “ageing” her character through her performance, from giddy youth to senile old-age. Apparently some artistic licence was taken with the details of her death, but I thought the slow-motion contorting of her face during the fall was very effective (and deeply effecting)… I can’t say I was always that emotionally invested in Elizabeth Tudor as a character, but I was often in awe of Duff’s idiosyncratic acting style, and her commitment to the role. 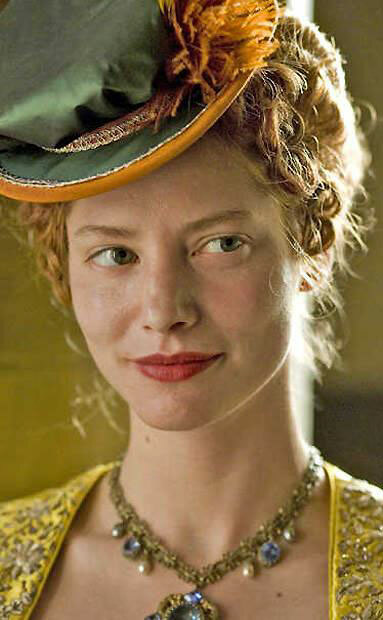 There weren’t many other significant female characters here, though Emilia Fox made quite an impression as Lady Amy Dudley, the ailing wife of Elizabeth’s childhood-crush-turned-platonic-love-interest, Robert Dudley (Tom Hardy)… and Sienna Guillory got a few stand-out scenes as ‘Lettice Knollys’, the Queen’s long-serving lady-in-waiting, who hooked up with Dudley behind her mistress’s back, and was subsequently banished from court… only to return decades later to be snubbed all over again, when Elizabeth took a fancy to Dudley’s step-son, Robert Devereux (Hans Matheson)! I thought Elizabeth’s unconsummated and tempestuous romances with the two Robbies made for a fascinating through-line, and gave the story a unique emotional draw alongside the more typical plotting and politicking. Meanwhile, I couldn’t help bemoaning the fact that even though “Good Queen Bess” seemed to prove quite conclusively that a smart, motivated woman could successfully run an entire country without a husband by her side (or in her stead), Patriarchy simply reasserted itself after her demise and trundled on regardless… GAH!!! This entry was posted in Rants about Music, Rants about TV and tagged Amy Dudley, Anne-Marie Duff, Emilia Fox, Lettice Knollys, Mediæval Bæbes, Medieval Babes, Queen Elizabeth I, Sienna Guillory, The Virgin Queen. Bookmark the permalink. 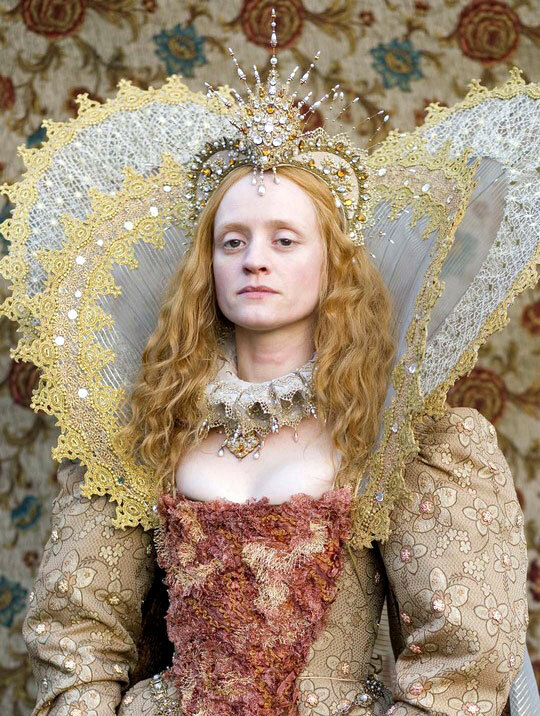 Do you have pictures of Emilia Fox in ‘The Virgin Queen (2005)’? since Robert left she remained very lonely, it's been a year and a half since she last saw him and he completely forgot about her, her death scene was so sad, she committed suicide so she would not become a hindrance between him and the queen.